You are all excited to come down to Patagonia and do the Torres Del Paine W Trek. All you have to do is plan it… Not to worry! This guide should help answer some common questions people have about the W and how to make it a reality. Regardless of where you stay in the park you will have to pay for bus from Puerto Natales to the park (~$10 USD) and an entrance fee (~$25 USD). There are two free campsites in the park: Campemento Italiano and Campemento Las Torres. Las Torres seems to have seasonal regulations and you can only stay at Italiano one night. Likely you’ll camp somewhere else on your trip and you’ll have to reserve a campsite through one or both companies that operate in the park. There are multiple refugio operators because half of the park of Torres Del Paine is protected under Chile’s National Forestry Corporation (CONAF) and the other part owned privately by Fantastico Sur. Fantastico Sur operates all refugios on its region of the park which extends from the Valle del Francis to the Base de Las Torres parts of the trail. In the CONAF areas, the refugios are operated by Vertice Patagonia. If you are camping all you really need to know is that both websites have an online reservation system. We only saw this view of Valle de Francis (middle) because we did the reverse W. This is where our Grey II boat dropped us off on our day leaving the park. The Torres Del Paine W-Trek has been made popular partially due to its refugio system that allows visitors to hike the circuit without staying in a tent. I go into detail about what the Refugio experience is like in Torres Del Paine in another post, so I’m going to focus on the logistics of my trip which involves primarily backcountry camping here. The typically way people do the W is starting at Campamento Paine Grande either by hiking in or taking the Catamaran from Cafeteria Pudeto. 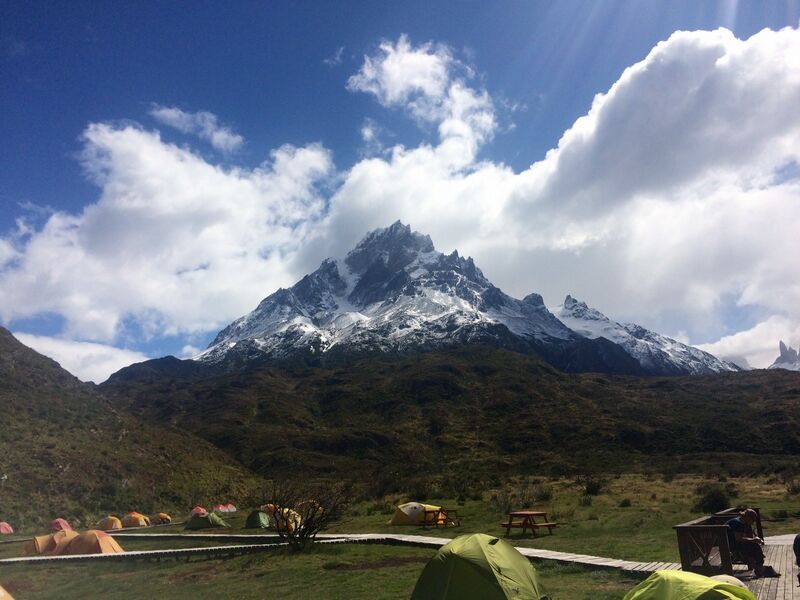 Their first day they camp at Paine Grande and day hike up to Campamento Grey and back. Next they go East up Valle del Frances, around and up to Base de Las Torres and then out via bus from Hotel Las Torres. One reason I was told people go West to East was that the wind goes from West to East off the glacier. My group however, did it the Reverse-W. Starting at Las Torres and going West. We didn’t notice directional gusting as too much of a factor on trail either. The benefits of the reverse-W were that we were able to day hike up towards John Gardner Pass along the glacier (a highlight of the trip) and combine a boat ride to the glacier and an amazing view of the whole range from Hotel Lago Grey on our last day. Rain turned to snow going up to Base de Las Torres. Patagonia is known for its wind so much so that seasonal wind charts accompany the typical rain and temperature charts online. However, if you are from an area with strong winds such as the Great Plains or Tornado Alley in the United States the winds won’t be that startling. While there we experienced gusts that you could hear coming and moved us around a bit but nothing that knocked us over or made us crawl. However, the potential is there with 80 km/hr winds reported past the first Mirador in the Valle de Francis and a group that told us of 120 km/hr winds when going over Paso John Gardner on the O-circuit. This wasn’t the regular for us. Some precaution is necessary though to stake down your tent first to avoid it blowing away and always stake down your guy lines. The worst howling winds we had was one night at Campamente Cuernos that pushed in our friends tent poles, a number of backpackers told us several stakes were pulled out overnight. The next morning I found a group of people sleeping in the cook hut when going to cook breakfast, their tent a broken mess on the floor. However, for all the wind we experienced it was still less than the constant gusts I felt on the West Face ascending Mt. Shasta. Avoiding carrying more than you need and facing broadside to the wind (like in the video above) is easy to do. Other than wind, it is important to think about temperature and precipitation. This is mountain weather and it is common to experience all four seasons in one day. Looking at the precipitation charts, it shows that most days contain some moisture. In fact I think I only saw the sun for six hours in the six days I was in Torres Del Paine. We had near constant rain / slurry / snow for our first three days and the rest had some part of the day raining while overcast. Precipitation in near freezing temperature is also a bad combination which makes it feel much colder than the thermometer reading. 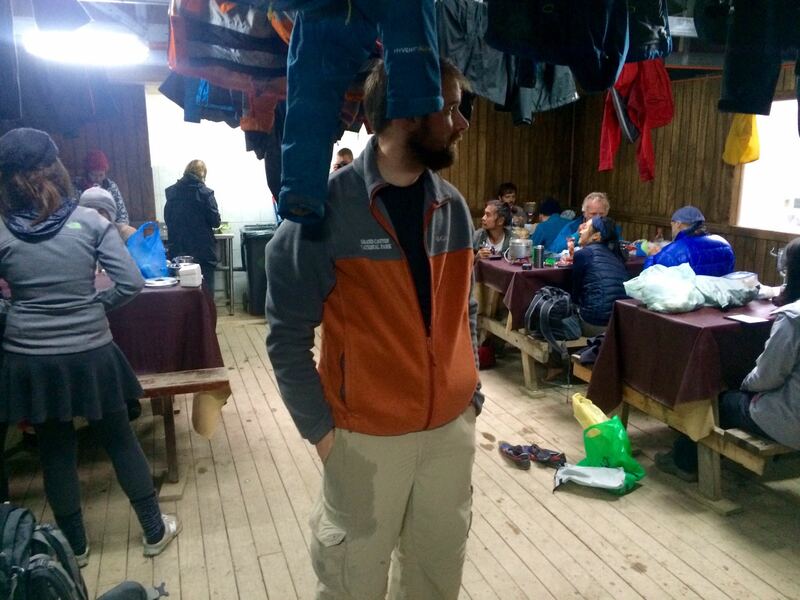 Make sure you have a camp towel, water proof jacket + pants and a tight fitting water proof backpack cover. 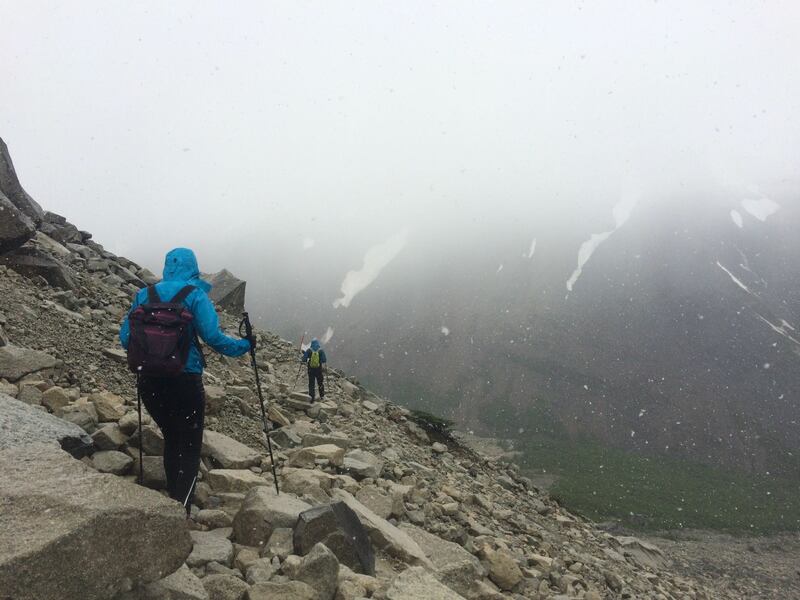 Consider reading The Hiking Life tips for wet and cold weather. Lastly, remember there is a ozone hole down here and if there is a clear sky the UV rating is a 10/10. This is intensified in snowy environments such as glaciers. Make sure to wear sunscreen on sunny days and sunglasses. Cooking hut in Campemento Chileano. Everyone was hanging up their wet clothes and eating after a long day..
Dinner alone can cost $24 USD per person at a Refugio so it makes sense to consider cooking yourself on the W. I recommend bringing a standard propane stove top since they are small, expensive to rent and you can readily find propane down in Puerto Natales. Check out this guide for bringing it on the airplane. The high winds in Torres Del Paine cause a high fire risk and the park has been devastated by two fires in recent history. As a result, fire is prohibited and all cooking must take place in a cook hut. The cooking huts at the refugios commonly have a stove, solid roof, wooden walls and wooden floor. The free campsites take the essentialist approach: dirt floor, drafty walls and a tin roof (everything you need). The huts are a great atmosphere and I met a lot of interesting people while preparing and eating dinner. The downside is that some refugios lock these huts during “closed” hours and don’t unlock them until 8am or 9am. The sun is often up at 6am and this often means you either have a really late start or you don’t get to cook a warm breakfast at these places. Surprise! The refugio breakfast is open earlier than the cook huts! Lastly, don’t worry about water! Everywhere in Patagonia the water is safe to drink out of the tap or out of the stream. Filling up a zip lock bag of instant coffee the night before the W.
There is a heavy tax on foreign imports so things like Cliff Bars, Mountain House, etc. cannot be found down here. Additionally, many of the food bars down here are cereal bars full of sugar (Chileans love their sugar) instead of the more balanced power bars I normally eat. If you want anything like this you’ll have to bring it down, however beware that Chile has strict regulations regarding what food is brought into the country. Luckily there are a few great stores where you can buy tons of dehydrated ingredients (fruits, nuts, oatmeal, no mountain house-like meals) and you can get pasta or ramen at the grocery. Ask your hostel and they will be able to point you in the right direction. Bring a bunch of extra zip lock bags, they will serve you well! 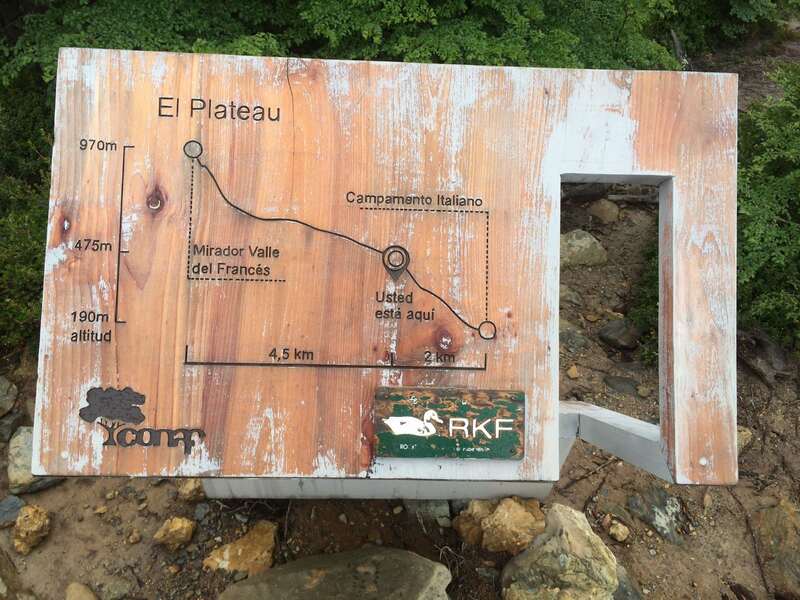 One of many signs on trail showing how far and elevation profile to next point of interest. Searching for a map of Torres Del Paine beforehand was very difficult since many maps were inconsistent regarding whether some refugio/campsites existed or not and for whatever reason, map makers in Patagonia prefer to note routes in time rather than distance. For accurate elevation and distances I finally had to use an AllTrails map I made, however I would also recommend the official CONAF map and the Fantastico Sur map. While in the park we found the trails well marked throughout in both English and Spanish, but I didn’t start to see broad overview maps until entering the Torres Del Paine park at Campemento Italiano. Don’t rely on getting a map at administration, we were told they didn’t print enough in 2015 and were rationing. We never received one. The trail is very uneven and eats your knees. Bring hiking poles. 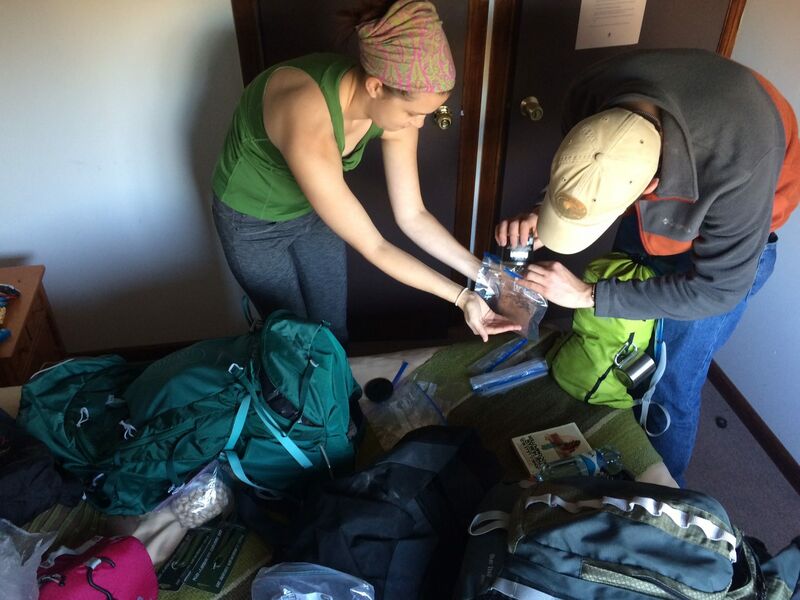 Before booking, ask your hostel if they will hold your bag while you are in Torres Del Paine. Mine did free of charge. Go to “Basecamp” in Puerto Natales for a free talk about trekking in Torres Del Paine. Some of the refugios have signs to lock your tent when you leave it. Might be worth bringing an extra TSA lock. The only real predator in Patagonia is the Puma which is seclusive but also spends some time around the campsites. Leave your bear bucket and spray at home! Check your 65 L bag and put it in a duffel to protect its straps. This also gives you a single access lockable bag for the rest of your trip as opposed to a backpack which has many entry points. Now that you are prepared for the W, check out the trail report for my trip from early November 2015 or what to expect from the refugio experience.